Happy Cinco de Mayo! Instead of the typical bright and bold Mexican inspiration, I think a sweet palette of greens, yellows, pinks, and dusty blues would be fun. Some succulents. A taco truck. Margarita cupcakes. A toast with tequila shots. Such a festive fun day! 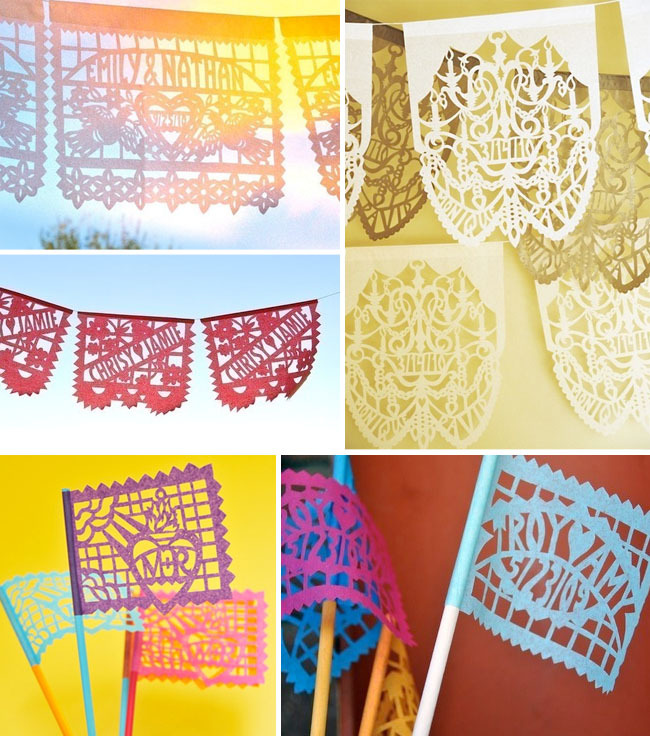 Another element I love from Mexico is papel picado. Papel picado is the traditional folk art from Mexico that involves cutting out intricate patterns on colorful tissue paper. The tissue paper is then glued to a string in a line to form banners which are used as decorations for festivities throughout the year. This wedding used them in all white which I loved the look of – such a pretty element. A great resource for them is Ay mujer. They will customize them with your name, date – and your own design! They also make cute little flags. LOVING this inspiration!!! Those intricate patterns on the paper are so neat!! Thanks for sharing! I love the muted colors mixed with traditional details… makes it all look modern without sacrificing pretty Mexican design elements! perfect post for today! love it! Yeah! I love all things 5.5. Love the pallette. a taco truck?! heck yeah! lovely board! happy cinco! Very lovely couple! cinco de mayo! Best wishes! more LOVE! 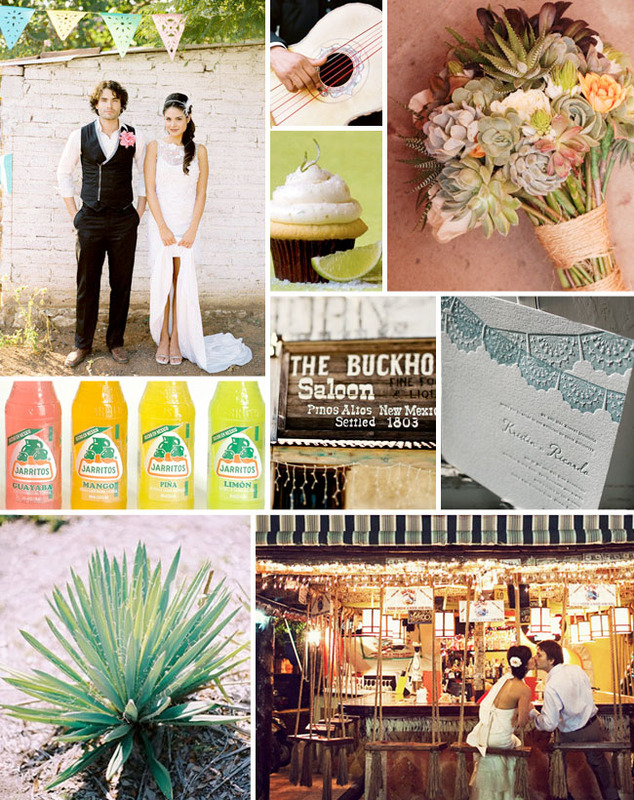 This inspiration board is amazing and totally fits for Cinco de Mayo! I love the bright colors, the fact that it is laid-back but classy at the same time, and really evokes the Mexican culture. I love this! I think this would be a perfect wedding theme or a perfect destination wedding. This is so my friend Rachel! She’ll love this. Thanks! Is there anyway to get information on that bouquet? Thank you so much!! Beautiful!! This is such a fun board. and some great inspiration! oh no! I remembered this inspiration board and LOVED it, but the photos aren’t working for me now. My fiance and I have decided to incorporate some of our latino background into our wedding and we were looking for inspiration- will the photos work later? I don’t think it’s my computer because everything else on the site is normal…. We’re having our wedding on Cinco de Mayo. :] And our color palet is similar too! <3 Thanks! is there any additional information that you can provide about the bouquet? 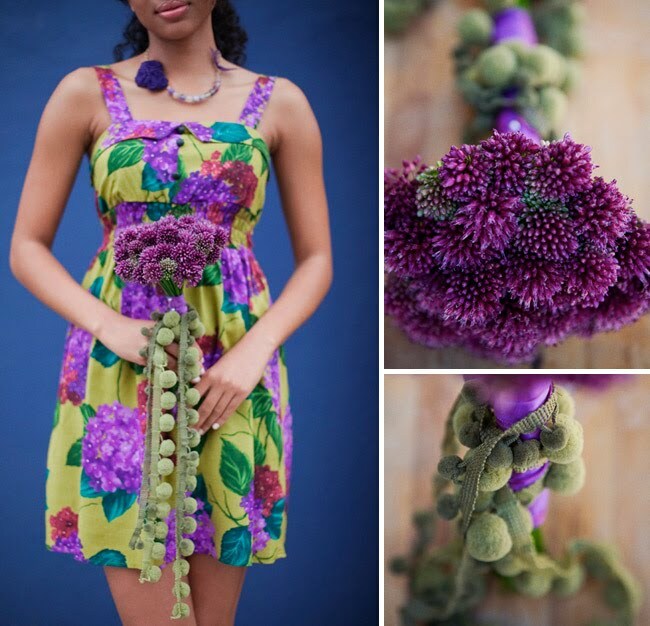 florist or photographer? This is awesome! Thanks! I’m doing a Central American themed wedding, including Mexican food, Cuban music, and Panamanian mola decor. It symbolizes periods in my life, growing up in a largely Mexican influenced city (Denver), deploying to Guantanamo Bay in 2004-2005 when I was in the Army, and being the daughter of a Navy brat who grew up in the Panama Canal zone. These would fit right in for my decor! i am looking for green shoes…any ideas on where to find them? i have found a few but not what i am looking for. i love the green shoes pictured in Jen’s profile pic! Absolutely love this. We wanted to do a destination wedding in Mexico, but our children really want to be part of the wedding a taking them along is not financially feasible (nor would it make for the romantic two of us vacation we wanted), so we decided to do a wedding on a local beach with a fiesta inspired reception. This is great inspiration! Love this idea! And margarita cupcakes…yum! We’re tweeting this out ASAP. Happy Cinco de Mayo!